6 Music Get Playing Champion Shaun Keaveny was learning the drums and Get Playing found him a band to play in. Shaun Keaveny plays the drums – this was the sample provided to producer Ahmed Best (AKA Jar Jar Binks from Star Wars). Shaun wanted his drums to be available online for others to be able to use; thereby continuing the legacy of Get Playing. Follow the story of the band on Shaun’s show (scroll to the bottom of the article page). 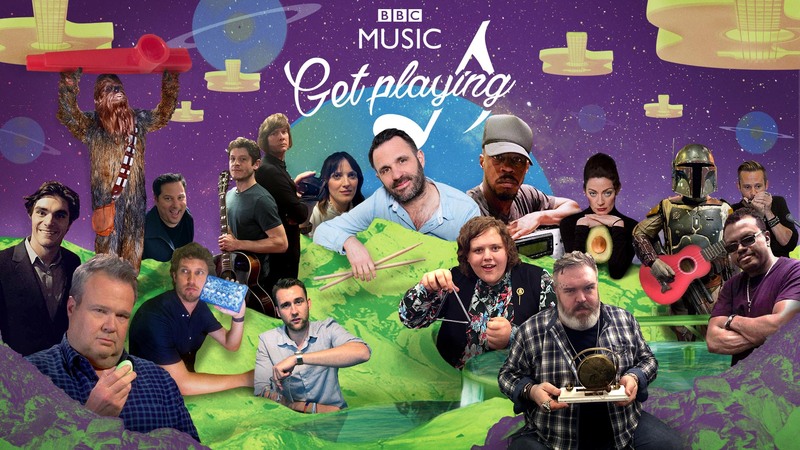 BBC Music Get Playing was aimed at lapsed players at all levels aged from 16 to 90. The song the Virtual Orchestra was to play was the Toreador Song – but there were parts for non-orchestra instruments too, including electric guitars and drums. The All Star Band provided an opportunity to have a regular slot on Shaun’s breakfast show where the Virtual Orchestra could be mentioned – thereby getting regular ‘join the Virtual Orchestra’ messages out to a non-classical music audience. I comissioned Jamie Stangroom, a music journalist and producer with a track record in pestering unsuspecting celebrities to do unexpected things to find the members of Shaun’s band. The members were all to be taken from popular culture so content could be syndicated out across the large fan bases of programmes such as Dr Who and Game of Thrones. Members included Paralympics and Breaking Bad actor R J Mitte and Jon Heder (aka Napoleon Dynamite). R J Mitte’s clip appeared on BBC Sport and Jon Heder’s was picked up by BBC Entertainment News and the NME before going global. There were regular slots on Shaun’s breakfast show where Jamie updated Shaun on his progress. The track was mixed by producer Ahmed Best (Jar Jar Binks from Star Wars) and it had its world premiere on Shaun’s show on Thursday September 15.